Did you formulate your online marketing strategy 2019? If so, what did you base it on? Last years results? Your Google Analytics reports? The predictions of a soothsayer? What I’m trying to get at is that it can be difficult to plan your next steps without anything to base them on. Preparation is always better when grounded in hard, verifiable data. For that reason, in this post we will summarize the findings of some of the most recent online marketing statistics and research. We will show what is likely to work this year and what isn’t, important changes in the online marketing sphere and what that means for you and your site. In the end, we want you to be able to confidently make decisions about where to take your online marketing strategy in 2019. Let’s get started. 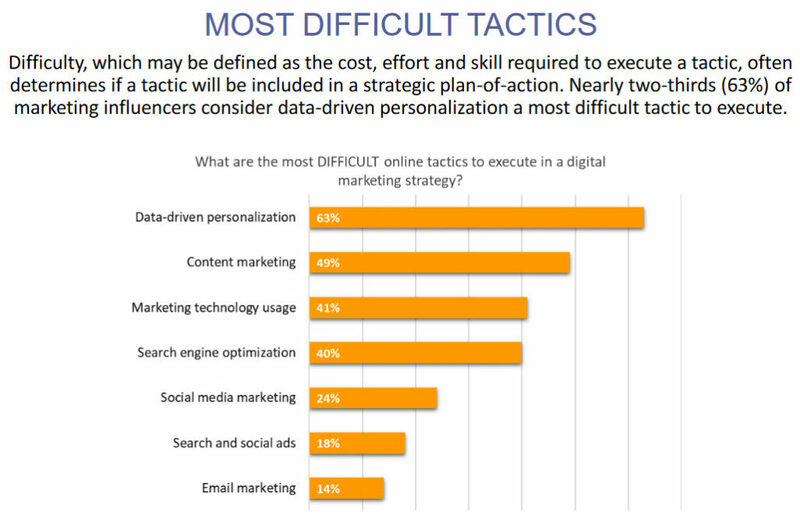 Where is Digital Marketing Headed? 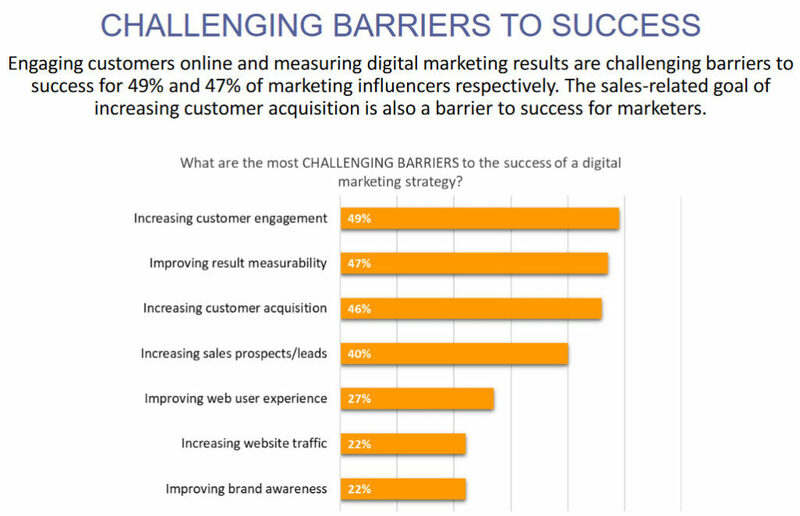 For the first part of this post, we will focus on the 2019 Digital Marketing Strategies Survey Summary Report by Ascend2. It was done in October 2018 with the participation of 190 marketing professionals. Here’s what they had to say. One of the first findings is that the online marketing sphere is still expanding. A full 88 percent of participants stated that they plan to increase their budget in this area in some way. This absolutely makes sense. These days potential customers spend much of their time online and marketers need to adapt to this reality. For that reason, instead of focusing on classic means of advertisement, many continue to put emphasis on the digital realm. If many of your peers see chances to grow in this area, why not you? When asked about the effectiveness of different digital marketing practices, most participants (58%) put content marketing at the top of their list. Runner-ups were SEO (50%) and email marketing (47%). The message is clear: to succeed in 2019, you need to continue (or start, depending on where you are at) creating high-quality content. It forms the basis for many other tactics such as SEO, paid advertising, email marketing and more. Consequently, coming up with a content strategy should be very high on your list. However, this is easier said than done. Many marketers also consider the creation of content to be one of the most challenging bits. 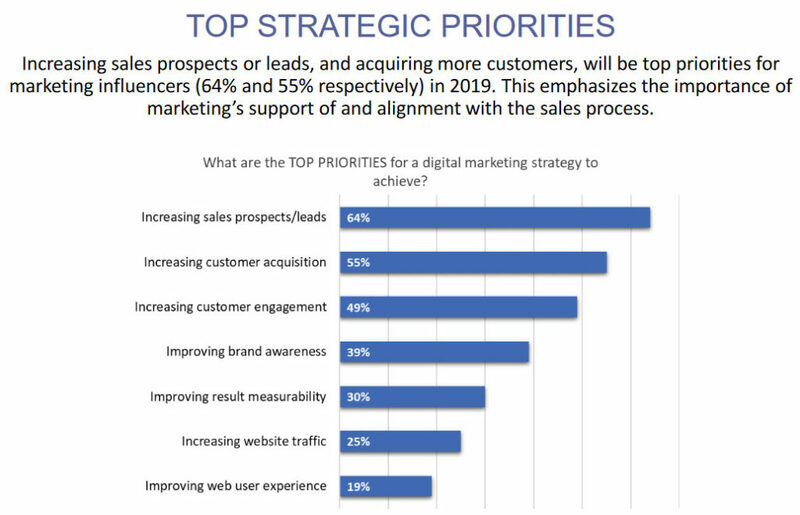 When asked what their top strategic priority is for 2019, most professionals stated increasing sales, prospects and leads as well as acquiring more clients (50% and 47% respectively). As we just learned, the main tool to achieve this for most is by doing content marketing. Consequently, when putting together your online marketing strategy in 2019, you a) need to formulate your own goals and b) make sure your content strategy aligns with them. 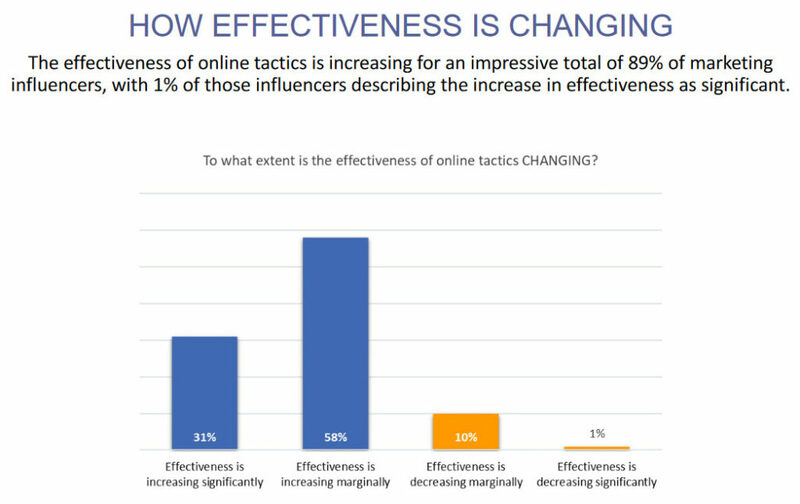 Finally, when asked about the effectiveness of their marketing measures, a great majority of participants saw an increase. Almost one third even judged it to be significant. 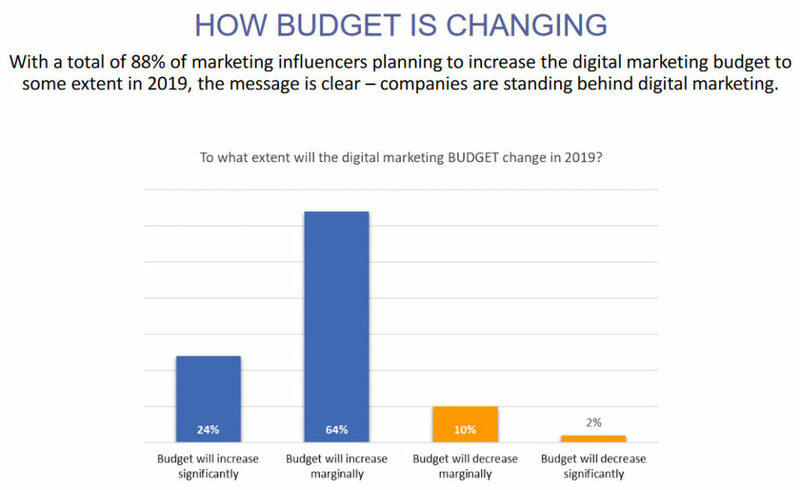 The next time you or your superiors feel on the fence about investing in digital marketing measures, be assured that for the majority of people it’s worth it. After dealing with the development of digital marketing, let’s now talk about the devices people use to access the Internet. One of the things you should already be aware of is that mobile devices now make up the majority of Internet devices worldwide. 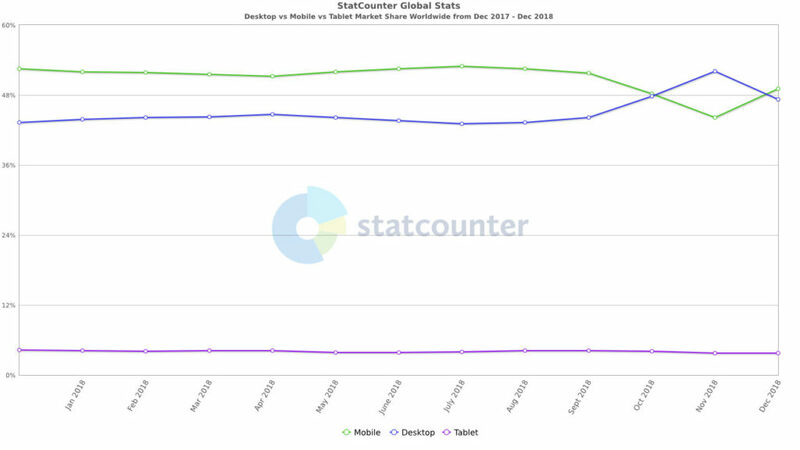 For much of 2018, their share of Internet traffic was over 50%, with desktop computers trailing around 44%. Tablets came in at about 4%. Of course, if you are already in the mobile-friendly camp, continue what you are doing but also examine how you can further cater to an audience on phones and tablets. 7. Is Messaging an Untapped Marketing Channel? 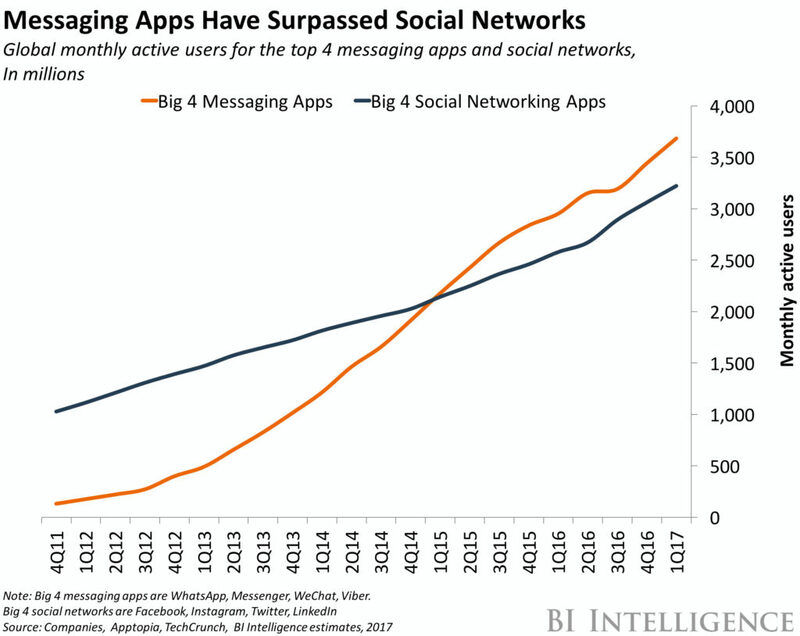 When talking about mobile devices, you can’t forget about messaging apps. Due to the possibility to interact in real-time and one-on-one, the WhatsApps, Telegrams and Facebook Messengers of this world are a great hit with consumers. However, not a lot of people are aware that their user number actually surpass social networks. Plus, the time that people spend on these apps are still on the rise. As a consequence, if you feeling daring and want to try out a new marketing channel, this could be it. For more information on marketing your website or business on WhatsApp and Co, check this article. However, SEO is also an area that is constantly changing. For that reason, it’s important to know the latest developments. When talking about search engines, we usually mean one in particular: Google. With over 90% market share worldwide, is not just a search engine but the search engine. The share is even higher among mobile users. In addition to that, you might want to start with the posts above. People care about security and online threats. There have been too many reports about security breaches and leaked customer information lately for them not be affected. It’s one of the main reasons for the new GDPR guidelines. Besides following general security guidelines, one of the most important topics here is using HTTPS encryption, especially if you own an online shop. What used to be optional, has now become a must-have. In fact, 84% of people will abandon a purchase if they’re dealing with an unsecured website. In addition to that, Google has been using SSL encryption as a ranking signal since 2014. Starting last year, their Chrome browser also actively warns users if they are connected to a site that doesn’t use it. 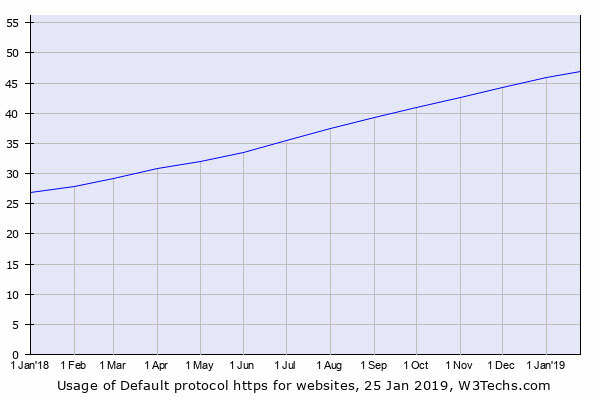 Despite that, at the time of this writing, the percentage of websites that use HTTPS by default is below 50%. The aforementioned mobile devices are not the only ones upending the online landscape. More and more people access information on the web via hands-free methods. Assistants like Google Home and Amazon’s Alexa have been a big hit with consumers. In the US alone, one quarter to one-third of the population now own a smart speaker or use a voice assistant at least once a month. To get ready for this development, read our post on the topic. Finally, when talking about search and online marketing, we need to talk about video. The popularity of animated visual content has been steeply on the rise over the last decade or so. 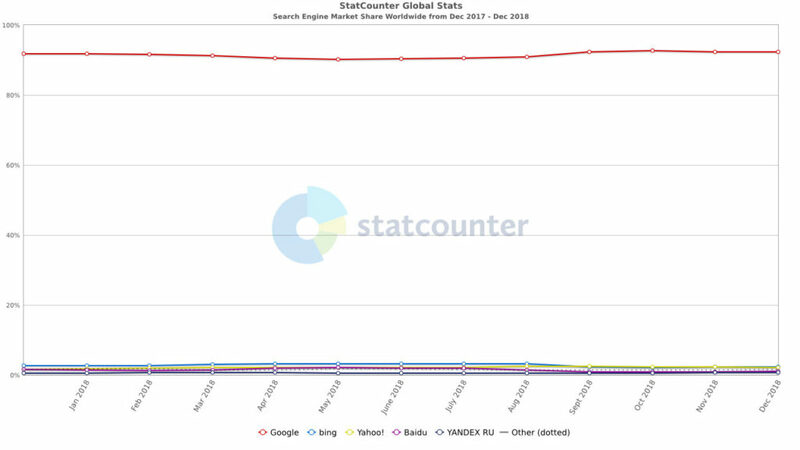 By now, YouTube is not only the second most popular search engine in the world but also the second most popular site overall. In addition to that, by 2021 video is projected to make up 80% of all internet traffic. This especially applies to mobile devices, which in 2017 already accounted for 69% of digital media time. In short, to give your website a push this year, consider creating some videos. Yes, I hear you, it’s not that easy. However, when you pull it off, it can have excellent ROI. Putting together an online marketing strategy for 2019 can be daunting work. There is a lot of stuff out there you can try out and finding the right approach is not necessarily an easy task. Thankfully, there are research and statistics on the matter that can point you in the right direction. Hopefully, you have found some nuggets of information that will help you with your 2019 online marketing strategy. If you know of any other research that would be helpful, please don’t hesitate to share it with the rest of us. Is there any other research that shapes your online marketing strategy 2019? If so, please let us know in the comments section below! 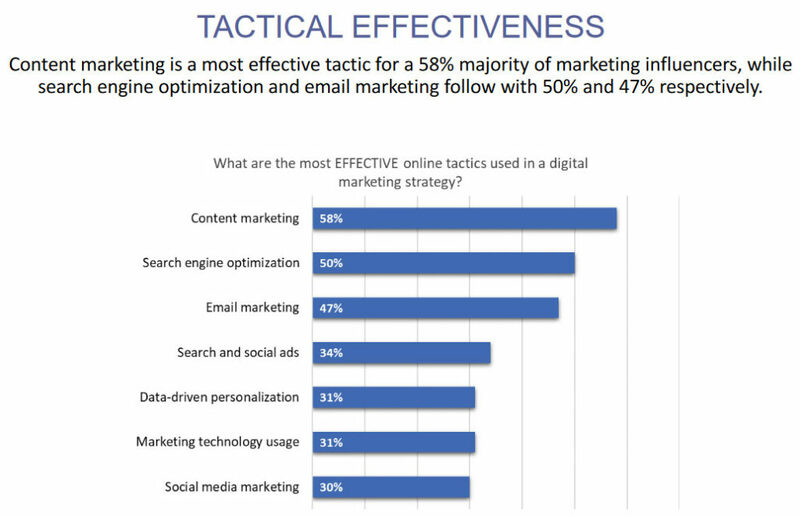 The post Online Marketing Strategy 2019 – Use These Statistics to Plan Your Year appeared first on Torque.